Our Little Bird has officially graduated Senior Kindergarten and is off to Grade 1 in the fall. And I cried like a baby! She woke up early that morning, excited to wear her frilly sun dress and sparkly shoes. She knew how she wanted her hair done and was careful when she ate her breakfast so she didn’t get dirty. She was all smiles as we dropped her off at school, looking forward to seeing us again at the ceremony in a few hours. As we were saying Happy Graduation and congratulations to her that morning, the Little Mouse summed that up perfectly, by telling her sister “Happy Gradulations”. Back at home, I wrote in her card and cried. D and I recorded a little message for her and my eyes welled up again! I was going to be a mess, I already knew it! My mom and D’s parents all met at our house at 10 am and we made our way to the school. 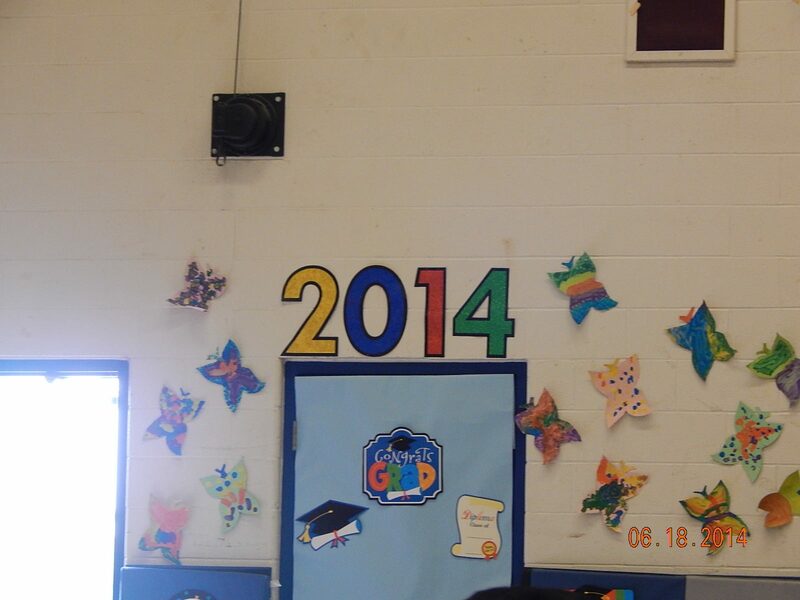 I found an aisle seat and had tears in my eyes as I took in the artwork on the walls, the painted butterflies and the 2014 Graduation decorations. The students filed in, looking sharp in their party clothes; boys in ties, girls in pretty dresses. Queue Happy by Pharrell Williams and each of the 34 students skipped their way to the stage and took a seat. It was adorable. 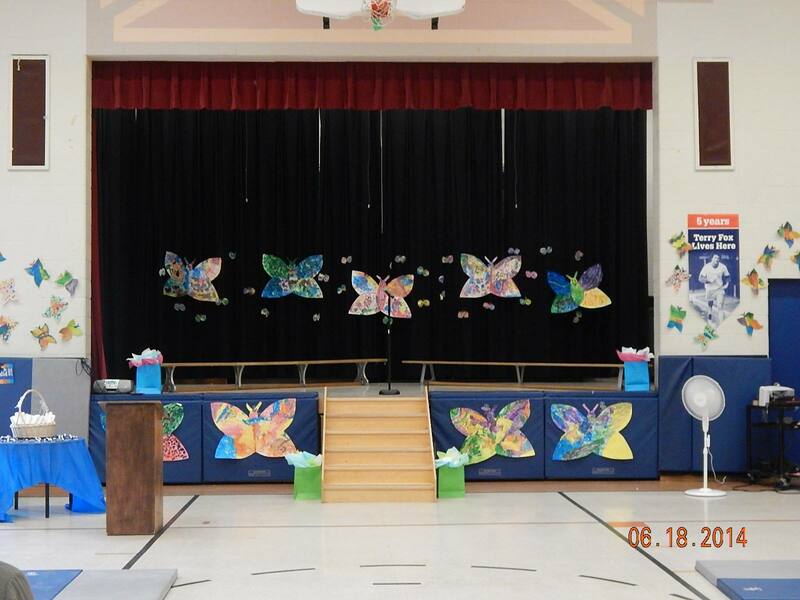 A few of her friends got up to welcome all the parents and grandparents to their graduation and the principal’s speech fell in line with their “Spread Your Wings” theme. She told them not to be in a rush to be 7 or 8 years old, but to enjoy being 5 and 6. She told them that there would be more work in Grade 1, but to remember to have fun and try hard. I’m not sure if they understood, but I could see the Little Bird listening to her, as I…well, I cried! Then they showed a video where each of the students held up a piece of paper under the words “when I grow up…” There were some kids who wanted to be firefighters, business men, mommies, baseball players and singers. There was one kid who said he wanted to be a cop. One of her friends wants to be a gamer and one wants to be a hairstylist and a make-up artist! The Little Bird said she wanted to be a teacher. Following the video, some songs and more tears (mine, not anybody else’s), the teachers called the student’s names one by one to get their diploma. We were then encouraged to take pictures. They had a seat set up under the “2014 Graduation” sign where they each posed wearing their graduation medals. After the ceremony there were treats and refreshments and their real diploma with graduation school picture, which we got to take home. She took some pictures with her teacher, her friends, her grandparents and us. She was so proud and happy, as were we. I can’t believe she is going to Grade 1 in September. The last couple of years have flown by. I am grateful she is, for the most part, well behaved. She’s had her struggles, but has found her way through them. She is a bright and independent creature with a great imagination and love of reading. She is thoughtful and inquisitive and caring. She loves her friends and has a great sense of humour. I know we start a new chapter in September. Grade 1 means a new playground and more interaction with the big kids. While I am a little nervous about that, I know she will find her way. Carve out a little place of her own in this beautiful little school of hers. She will probably have different kids in her class, and she may not know them all, so that makes me nervous too. But she will warm up to them (and them to her) and find where she belongs. She will be reunited with the older kids that were in her class last year, when she was in JK and they were in SK. She might even be in the same class as some of them, if she ends up in the split class. (We have a lot of those, due to the numbers we have in our little school). And I’m okay with that too. I am probably more nervous than she is, but I have confidence that she will find her own, make her mark and be okay. I don’t know that I confidently could have said that as she started out in JK, but she has shown her resilience, her determination and while shy and quiet at times, she is one tough Little Bird. So, spread your wings and fly, my angel. The world is your oyster. I hope you take every opportunity and shine like I know you can. We love you lots and are very proud of you. Happy Gradulations, Little Bird. Enjoy your summer!